AACT is composed of 52 tables that provide information related to clinical trials. The database contains multiple schemas, the main one being 'ctgov' which provides data retrieved from ClinicalTrials.gov. The main table in the ctgov schema is 'studies' which relates to all other ctgov tables through the NCT_ID. The ctgov schema also includes 2 tables that provide MeSH terms (Medical Subject Headings) which are published by the National Library of Medicine (NLM). The NLM has populated browse_conditions and browse_interventions tables with the MeSH terms they've determined help describe a study. The NLM updates the MeSH thesaurus each year. AACT provides some older versions of the MeSH thesaurus in the 'mesh_archive' schema. AACT also includes a set of project schemas (prefixed with 'proj_') which contain datasets collected/curated by previous researchers who used the AACT database to conduct their study. These datasets enhance the value of the clinical trials data in a number of ways. 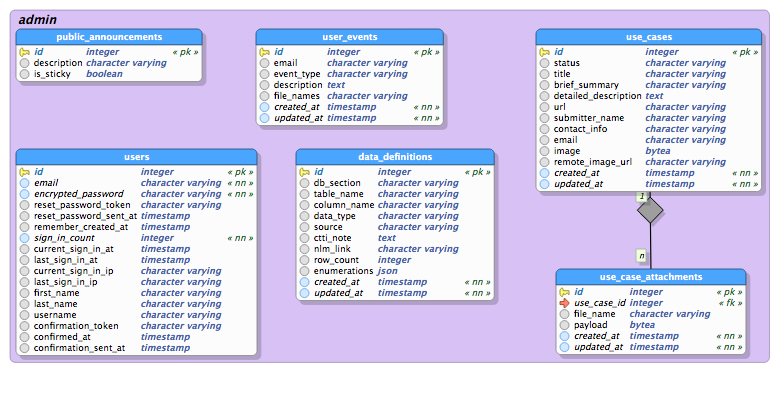 Descriptions of project schema tables & columns are included in the data dictionary below. The Projects page provides more comprehensive information about these datasets. Click here to view a listing of all 52 tables with description and row counts. Detailed information about all data elements included in these tables can be found in the data dictionary below. Sort: Click on a column header to sort the table alphabetically by the values in that column. Search Support: The first column provides icons that support filtering. The larger magnifying glass in the top row toggles display of the filter row. The smaller magnifying glass below it can be clicked to launch a search (same as pressing [Enter]). Clicking the funnel icon will clear filter values. Authoritative Source: Please refer to the National Library of Medicine's (NLM) documentation for official definitions of all study/protocol and results data data elements. The icon that appears at the beginning of a row will open a tab in your browser to display NLM information about the data element on that row. Horizontal Scroll: All columns do not fit on a page; you may scroll horizontally to view and filter on additional information about the data elements. Source Column This column identifies the XML tag path used to obtain values for the data element from ClinicalTrials.gov API. Click here for the XML format specifications (xsd) and here to see an example of a study as provided by NLM via their API; this represents the source information used to populate the AACT database. Row Count Column Each table's primary key definition includes the table's current row count. Enumerations Column Some AACT table columns are used to store a discrete set of predefined terms (enumerations). For example, Public::Study.enrollment_type can only contain values: 'Anticipated', 'Actual' or null. If the table/column is for a set of enumerations, the data dictionary presents each of the enumeration values along with the corresponding number of rows with that value. The list below describes the 52 study-related tables in the AACT database and provides current row counts for each. Project tables are also defined at the bottom of this table. Database views & functions have been provided to facilitate data retrieval. These features are described below. The first table identifies a set of views that provide concatenate sets of values per study. These views are useful for people who need to generate a spreadsheet that contains one row per study and would like to include info for which studies often have multiple values, such as conditions. For example, if you need a comma-separated list of the conditions associated with a study, you may get that from the all_conditions view. These views are in the ctgov schema; all include 2 columns: NCT_ID & Names.